On July 1, the offensive for the port city of Hodeidah was officially put on hold (for the various phases leading up to the battle, see ACLED pieces on Operation Golden Spear, Operation Red Thunder, and Operation Golden Victory). While UAE foreign minister Anwar Gargash has pledged that the pause was aimed at giving UN Special Envoy Martin Griffiths more time to find a political solution – namely the “unconditional Houthi withdrawal from Hodeidah city and port” – it is yet unclear, and seems unlikely, that the Houthis will withdraw from the city. In the event that an all-out assault on the city indeed takes place – artillery shelling was already reported near Hodeidah airport on July 15 – this may result in attracting the anti-Houthi coalition into protracted urban fighting and in another blow to the already fragile political process. Yet the varied composition of this coalition carries serious implications for the continuation of the war, and presents a serious challenge for its regional sponsors. As of today, the various UAE-backed Yemeni forces fighting the Houthis seem to be referred to using the interchangeable umbrella names of “Joint Forces” and “National Resistance Forces” (NRF) – the latter of which was initially used to define the forces led by Brigadier General Tareq Saleh. These forces are made up of three major components: the Giants Brigade, the Guardians of the Republic, and the Tihama Resistance. The Giants “Al Amaliqah” Brigade is the largest component of the NRF, gathering between 20,000 and 28,000 fighters according to ground sources. Its two most prominent commanders are Abdulrahman (Abu) Zarah Mahrami and Hamdi Shukri al Subaihi. Its fighters are predominantly southern Yemenis, mostly Salafis – including a number that were expelled from Dammaj in Sa’dah by the Houthis in January 2014 – and tribesmen from the region of Yafa’. The Giants Brigade has been enjoying particularly strong support from the UAE, benefiting from both money and military equipment since at least 2015. Depicting the anchorage of the Giants Brigade in southern Yemen, the map below shows that this is the only force of the NRF that was reported to be active autonomously in the southern parts of Ta’iz governorate. In May 2018, Giants fighters allegedly overtook the Umari camp. Tareq Saleh’s forces are commonly referred to as the Guardians of the Republic. They are estimated at around 4,000 fighters, with an additional 5,000 believed to be trained in a UAE military base in the port of Assab, Eritrea. They were first reported to be active in April 2018, and are now based in a camp in Mukha city as well as in Khalid camp, where they are- present alongside Giants forces. The map above illustrates that their role was crucial in opening the road east of Mukha toward Taiz city. Their subsequent absence as an individual force along the coast and their reported presence near Hodeidah airport in June 2018 suggest that the Guardians have not been engaged in the frontlines, but have instead been moving up the coast by fighting at the rear and securing areas overtaken by the Giants Brigade and the Tihama Resistance. The Tihama Resistance is made up of an estimated 4,000 local fighters led by Ahmed al Kawkabani, a former marine from Hodeidah, and Abdulrahman Hajri. Sources on the ground indicate that, if the battle for the city goes forward, Tihami fighters will eventually take the lead because of the higher legitimacy they enjoy in the province. However, they do not seem to have the capacity to lead an offensive on their own. ACLED has recorded only six instances where they were acting autonomously over the past seven months. Compared to the Giants Brigade and the Guardians of the Republic, the Tihama Resistance seems to be enjoying limited support from the UAE, especially in terms of military equipment. These alliances of convenience between groups that ultimately have different ends but fight under a common banner today give ample space for future infighting. Last April, deadly clashes took place in Mukha after southern Giants fighters tore down a Republican flag raised by the forces of Tareq Saleh. More recently, southern observers and local media outlets have been extremely vocal against Tareq Saleh after he gave a speech in Aden on July 14. These were followed two days later by the threatening declaration of Abu al Yamamah Yafei, one of the most prominent military commanders in southern Yemen, who also happens to be supported by the UAE. These latest developments illustrate the complexity of holding the vast web of alliances the UAE has forged with extremely different groups together. For instance, while the Tihama Resistance is driven first and foremost by the desire to expel the Houthis from its Tihama coastal region, a number of Salafi fighters from the Giants Brigade are likely to be motivated by seeking revenge for their expulsion from Dammaj in 2014. 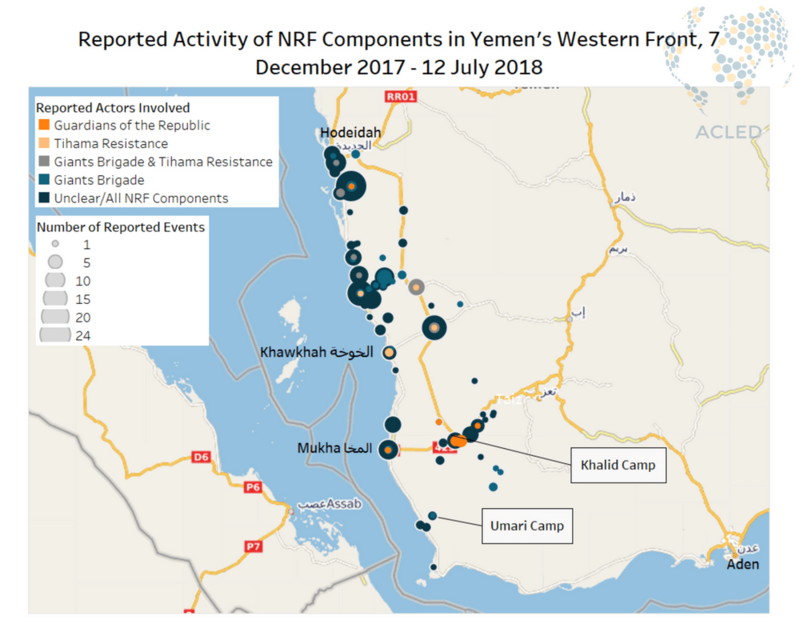 Empowered by their recent gains along the coast, they could be tempted to continue northward toward the Houthi stronghold of Sa’dah, even if a political solution to settle the fate of Hodeidah is found. As the conflict continues, the ability of the UAE to hold sway over its Yemeni clients, who are now well equipped militarily, is unclear. Yet these cracks are likely to become a defining feature of the conflict, as well as of the wider security landscape of the country once the conflict comes to an end.